Thank you for doing what you did... thank you for the fantastic interviews. You made us smile. You made our day. Charles Ramsey helped rescue a few girls who were kidnapped nearly a decade ago in Ohio. We've seen his interviews... let's send that man some cash for drinks, food, a huge party...whatever he decides to do with it. The initial $10,000 goal was an arbitrary number that I expect we'll easily pass. I, Robby Russell, of Portland, Oregon will see to it that every cent donated (after gofundme takes their cut) is delivered to him in the form of a HUGE CHECK from the INTERNET. In an effort to be transparent about this... we want to get a photo of him with said check to show that your money made it to him. If this relies on me flying there (thanks to everyone who has offered to donate their accrued airline miles...) so be it. If you're a Cleveland news reporter that wants to help me make this happen--please get in touch with me. If you want to help contribute funds to the victims, I recommend the Cleveland Courage Fund. Hello everyone... Charles has indicated that he's now on twitter... you can follow him here. This will likely be one of the final updates on this project. Earlier today, I deposited the money into Mr. Ramsey's bank account and am now waiting on him to confirm it made it to him. I want to take a moment to thank each of you who wanted to say Thank You to Charles. A Emylya Boateng, A J M V Does De Willebois, A M Marquez, Adam Peters, Adam Sant, Adham Selman, Adrienne Jones, Aj Burgess, Alan Morier, Alex B, Alex Torres, Alexandre Albert Galtier, Alexandrea Hernandez, Algernon Pratt, Ali Alnemer, Alicia Obrien, Alissa Vilardo, Allen Hoppes, Allison Espejo, Alyson Miers, Amanda Roberts, Amber Turrill, Amberlis Underwood, Ami Hines, Amilly Archibald, Amira Dan, Amy Spears, Ana Quevedo, Andrea Erwin, Andres Fromspain, Angel Gonzalez, Angela Eastwick, Anika Perry, Ann Lorenzen, Anonymous Anonymous, Anthony J, Anthony Sr, Aris Nicolopoulos, Atl Pittman Family, Azad Faris, Barbatra Waters, Bentley Plummer, Beth Greear, Bev Kuper, Bill Ward, Bradford Hamilton, Brandon Freeman, Brian Heyman, Brianna Robinson, Bridgit Obrien, Bruce Williamson, Bryan Snoddy, Bryan Streeter, Buffy Daniels Halo D, Byron Barksdale, Candice Candice, Candice Scott, Carcasi Family, Carrie Cutler, Carrie Newman, Catherine Cocco, Celia Reynolds, Chad Arcement, Chad Boonswang, Charisse, Charity Conley, Charles Coleman, Chaya S, Cherisse Moore, Cheryl Latif, Chicago Girl, Chin Don, Chris Harbaugh, Chris Lesko, Chris Novak, Christa Jepsen, Christopher Hussaini, Cindy Chartier, Claire L, Clifton Smoot, Clinton Hummel, Clyde Lerner, Colette Mclaughlin, Colette Widick, Colleen Cahill, Colleen Damico, Connie Langley, Corinne Dipietro, Cyndie Fussell, Dale Cox, Damon Greer, Damon Wells, Dan Carter, Daniel Kaiser, Daniella Cooper, Danny Lair, Dao Deming, Darbie Morris, Darrell Lettiere, David Darrough, David Grigsby, David Jolley, Dawna Nolan, Dc Anonymous, Dee Michael Thorne, Derek Sharp, Dianne Lintz, Dianne Small, Don Reed, Donnel Hinkins, Durka Durka, Eduardo Vargas & Melissa Vargas, Eimmij Jones, Elena Harshaw, Elie, Elizabeth A, Elizabeth Ahlborn, Elize Joe Bravo, Ellen S, Eric Daye, Erin White Kingsley, Evan Whitmer, F Gin, Fahim Areef, Fatima B, Floyd Neal, Foxy Edwards, Francesca Fericano, Frank Tillman, From A Mom Of A Teenage Girl, G B, G G, Gail Goring, Gary Clement, Gary End, Gayle Robin Vrobel, General Hafeezah, George Litera, George Logan, Gil, Gina Mickelson, Gloria Caruthers, Goma Rai, Greg Muden, Gregory Armstrong, Gregory Bair, Heath Sanders, Heather Mcconnell, Helen Nowak, Helen Day, Howard Sun, Huddy Hawes, Ian Vincent, Ike Hall, Irene Bowdry, Isabel D, Ivan Tseng, J Erickson, J P, J D Hoechlin, Jack Morris, Jackie Davis, Jacqueline, Jacqueline Carr, Jacqueline Warlick, Jaimie, Jake Krog, James Bailey, James Goodenough, James Raussen, Janet Bradford, Janet Kroemer, Jarrod Montague, Jason Gilbert, Javin Bond, Jay Kellogg, Jay Voigt, Jeanette Madden, Jeannine Waldock, Jeff Coleman, Jen H, Jenni Skidmore, Jenny Mac, Jens Jorgensen, Jeremy Brown, Jeremy Thehawaiianwonder, Jeri Washington, Jill St Laurent, Jim Anderson, Jim Nolan, Joao Virissimo, Jodie F, Joe F, John B, John Bond, John Clark, John Hendrickson, John Kay, John Mcclain, John Pfaff, John Stewart, John Toledo, John Wolverton, Johnson Shaffer Family, Jolene Haire, Jon Bayouth, Jonathan Cheatham, Jonathan Drayer, Josh Channell, Josh Siegel, Josie Moyer, Jt Haight, Julie Ries, Justin Cooper, Kafi Dublin, Kailani Hawk, Karen Kaske, Karen Norman, Karen Rochez, Karin Book, Kate Stoia, Kathy Sherpa, Keesha Williams, Keith Kenniff, Kelly Wright, Ken Geller, Kerstin L Ffler, Kevin Baumann, Kevin Welch, Kim Munson, Kirsten Castagnoli, Kris Solverson, Kristie Scott, Kristina Hernandez, Kurt Rein, Larry Cohen, Larry Wyatt, Lasalle Huffman, Lauraine Strussion, Lauren Titus, Lavern Nicholson, Lila Williams, Linda Durado, Lisa Baer, Lisa Russell, Lois Narcisse, Loren Scannell, Lou Marrero, Lyn P, Lynn P, Mandi Studler, Mara Granderson, Margaret Carle, Margaret Labik, Marie Mccormack, Mark Colangelo, Mark Runningen, Marlana Francis, Marlena Murphy, Marnie Mcdermott, Marta Alfonso Durruty, Martin Lubell, Mary Curlee, Matthew Harper, Matthew Haslett, Matthew Small, Maureen C, Maureen Grandon, Meg B, Melanie Kozik, Melissa Larson, Melissa Luecke, Melissa Stetzel, Meredith Marciano, Michael Waldron, Michael Wallace, Michelle Shaw, Mignon Neal, Mike Laroche, Mike Mondragon, Mike Solis, Mimi Mccartney, Mitchell Hecht, Molly, Mundo And Jennifer Harbaugh, Nancy Urick, Natalie P, Nate Kadlac, Nathan King, Nette Danjean, Nina, Nora Murphy, Olivia Mcafee, Pam Casey, Pam Rubin, Pamela Fornshell, Pat Koch, Patricia Howard, Patricia Murphy, Patricia Smith, Patrick Wilkens, Patti Theroux, Paul Cains, Paul Choi, Paul Wilkinson, Penny Hawkins, Philippe Jeanty, Polly Fredlund, Portia Culley, Rachel Peters, Raha Yavari, Raimonda Smith, Randy Kana, Reba C Mclendon, Rebecca Ray, Reham Breko, Renee Goldman, Rich Macdonald, Richard Brylski, Rick Hoff, Rob Garcia, Robby Russell, Robert Scott, Robin Joe Tobia, Robyn Talley, Romana Rychlik, Ron Mcclellan, Rosemary Birk, Rosemary Martin, Roy Littwin, Russell Ahmed, Ryan Orrico, Ryan Schwebel, Sal Sharief, Sallie Cheatham, Sammy Jankis, Sandra Bienkowski, Sara Nejat Bina, Scott Hawrelechko, Scott Mccarty, Scott Von Kamecke, Scout Bolt, Sebastian Ascencio, Shane Arndt, Shane Pfannes, Shannon Kay, Shara Lozier, Sharon Davis, Shaun Werkhoven, Sheila Donohue, Shelbie E, Sherry Bailey, Sherry Johnson, Sheryl Staton, Shondra Bergmann, Stanley Fields, Starr Prussner, Stephanie Haggarty, Steve Argule, Steve Leitner, Steven Howland, Sue Farris, Sue Guss, Sue Moreau, Susanne F, T Brown, Tamara Tinker, Tamatha Cook, Tammy Hoggatt, Tara Chisenhall, Teddie Ann Torres, Terry Dunn, Tess Fitzgerald, Texas Aggie, Thomas Littlejohn, Thomas Taylor, Tiffany Domneys, Tiffany Marie, Timothy Saldo, Timothy Smelser, Tina Labouve, Todd Donaldson, Toni Cox, Tony Chliek, Tony Faville, Tonya Atchison, Tori Nunn, Tracy Franklin, Tracy Hill, Ty Dorland, Tyler Leavitt, Vanessa Rick C, Veronica Planisek, Victor Iwotor, Victoria, Victoria Belle, Victoria Drake, Vijayakumar Thiyagarajan, Virginia Marshall, Wayne Halper, Wendy Louie, Wesley Hiatt, William Luciano, William Crawford, William Wise, Wooj Choi, Yon Moreira, Zack Guido"¦ and to the other 197 people who wished to remain anonymous. Today, I got a confirmation that all the donations were transferred to my account. I visited my bank this evening to get a cashier's check so that I can deposit in Charle's account tomorrow (another bank). Here is a photo of said cashier's check with the full amount (after GoFundMe/WePay took their fair share). Here is a video from Charles saying thanks to you all. Charles took a few moments to send over a SMS video earlier. It's short and sweet. I'm going to compile all of your positive comments and send those over to him as well. Just playing. Robby Good job bro! THANK YOU, ROBBY. YOU'RE ONE BEAUTIFUL MAN. There is some believeable media out there that Angel may have helped more than Charles is admitting. It that is true I hope Charles does the right thing and shares this money with him. Certainly Amanda Berry knows the truth of who got her out of that house. If he is being dishonest this money will likely self distruct...that would be a real shame! But our intentions here are pure and I am still proud to be a part of it! or just go to fox news and put in search charles ramsey i did not make the video fox news did. Merry Davis, or whatever your real name really is, your "story" does not exist. When I clicked on your link it appears to be non-existent. You are a fake and a fraud and have no place in this legitimate forum. Get permanently lost. I am Parents Against Predators and we have a quick question about this account for Charles Ramsey. Why not set this up in his name under his bank account? Robby, thanks for creating this forum to help all of us show our appreciation. You started and ended this campaign at the appropriate time. Well done. Robby, Thank you for arranging this. All I want now is somehow to see or hear an interview with you and Charles about all this. A recorded Skype call maybe? This not a skeptical thing, as I was one of the first donators. I just would love to hear directly and un-censored from Charles what he thinks about all this. Charles, seriously, you are a brave man that could have looked the other way, as sadly, so many others would have. Take the money, if anything to buy a sweet computer and sign up for YouTube and start a channel by just telling a story each week. I think you'll hit the ground running with about 605 subscribers! Angel ran away...if it were up to Angel the girls might still be locked up in that house. 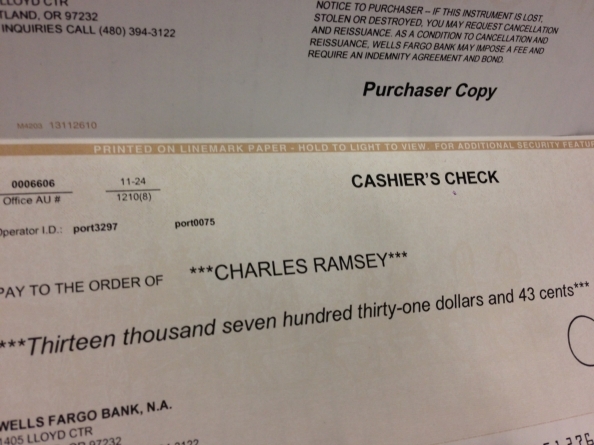 Very excited to see Charles get this money...so good of you to do this. To me every donor is part of "the solution!" Hope there is video of you giving the check!! To Charles, if you are reading this, I just saw your interview broadcast on CNN. When you said youd like to kick his head down a soccer field, my initial reaction was I wish you would have done it and I would have enjoyed helping you do it. But then reason sets in and we both know this would have been a mistake. Despite how much we all hate this monster, we must let the justice system resolve this case. You have taken the higher road and let justice run its course, leaving it in the hands of the police. That makes you a better person. As a woman I would like to see him suffer the same brutality he caused his victims. Lets hope jail time will cause his untimely demise. I feel for the victims immensely. I pray they can recover their lives, in time. Especially the eldest who was severely brutalized and beaten. WHAT A PIG. I also feel for his daughter from his first marriage who has severed all ties to her dad with the new-found information that he is a demon. So many victims. You are a hero. 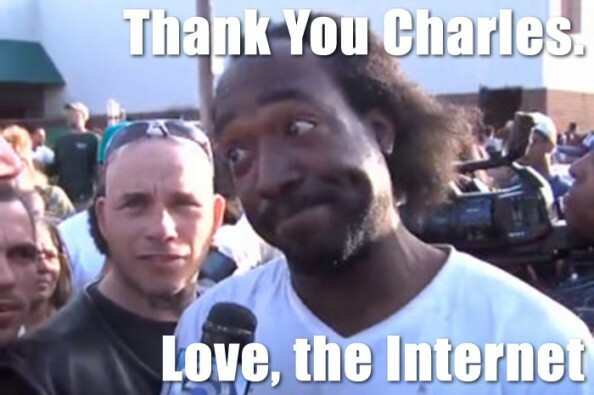 Very nice for the Internet community to donate to Charles Ramsey. Why don't you donate some to Angel who assisted Charles too? Leftover money should be donated to Amanda Berry, Gina DeJESUS, and Michelle Knight's families. Just a though. Ah Robby, you are the man. Thanks for putting this together and keeping it real! You are the man! You took action when no one else did. Thank you for being there. We need more like you. Take the money. You deserve it! The world needs more people like you. Your kind heart has touched the lives of so many people, in so many ways. You give us hope that good still exists. Be proud of yourself for this! God Bless you!! "Not getting involved" seems to be the norm these days. I appreciate that you did not follow the norm. Please accept my tiny gift..It's your time to be rewarded. ..don't worry the girls will be taken care of also...I'm certain book and movie deals will come their way. This story has truly moved my heart and the way that I look at people and life in general. Here we have a man who is struggling through life but when the call comes to help a desperate victim he doesn't flinch or think twice about doing the right thing. It brought tears to my eyes to hear this financially struggling man decline any reward money and pass it along to the innocent victims. What this monster did to these poor girls is nothing less than pure evil, but Charles Ramsey should inspire us all that we can do something about the depravity and injustices that are occurring in this world. Charles you are a great man and nothing less than HERO.